In an 8-quart pot, heat the olive oil and sauté the onions, garlic, and diced green chiles. Place beans back in the Dutch oven and add water/stock, chili powder, cumin, curry powder, cayenne, and salt and pepper. Stir well and bring to a boil. Reduce heat to medium and simmer for one hour, stirring occasionally. Next, soy milk and simmer another 30 minutes. Place the shredded vegan cheese in a large bowl and add the rice flour, toss to coat the cheese with the flour. Bring the chowder to a boil and stir in the cheese. Boil while stirring constantly until the chowder thickens to your desired consistency. Ladle chowder into bowls and top with the yogurt-cilantro relish. 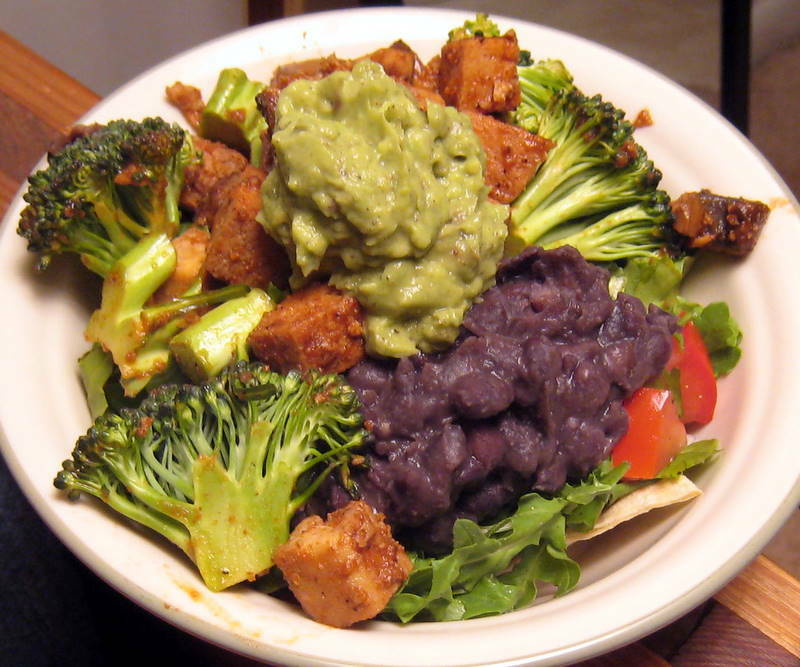 This is a salad of awesome: bbq tofu, mushrooms, broccoli, black beans, greens, guacamole! Heat olive oil in a dutch oven, saute tofu until golden on all sides. Add mushrooms, cook 1-2 more minutes. Add remaining ingredients and stir well. Cook about 10 minutes on low until the tofu absorbs most of the sauce. 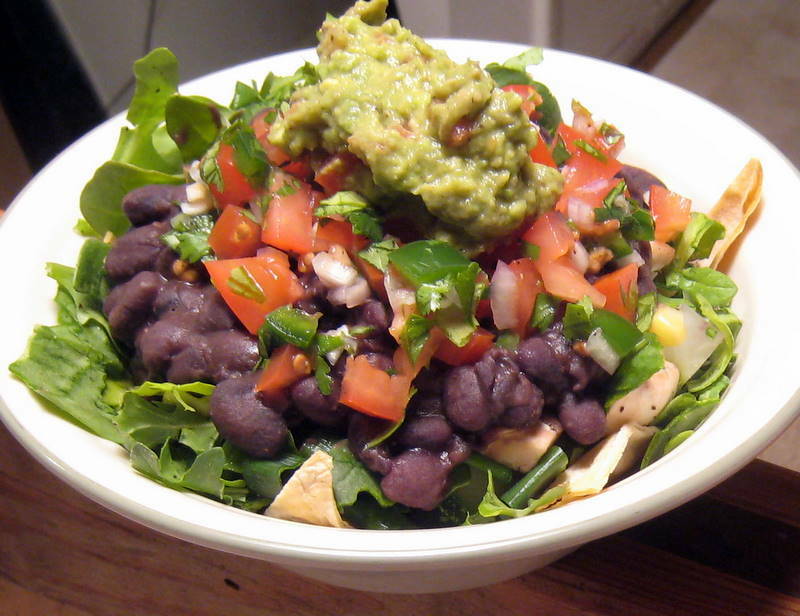 Black beans, arugula and spinach, corn, radishes, mushrooms, green onions, salsa fresca, guacamole, and baked tortilla chips. You’re welcome! If we ran a taco truck, this would be our signature dish. This week hasn’t been too good for health. When one of us gets sick, it’s likely that the other will fall sooner or later. 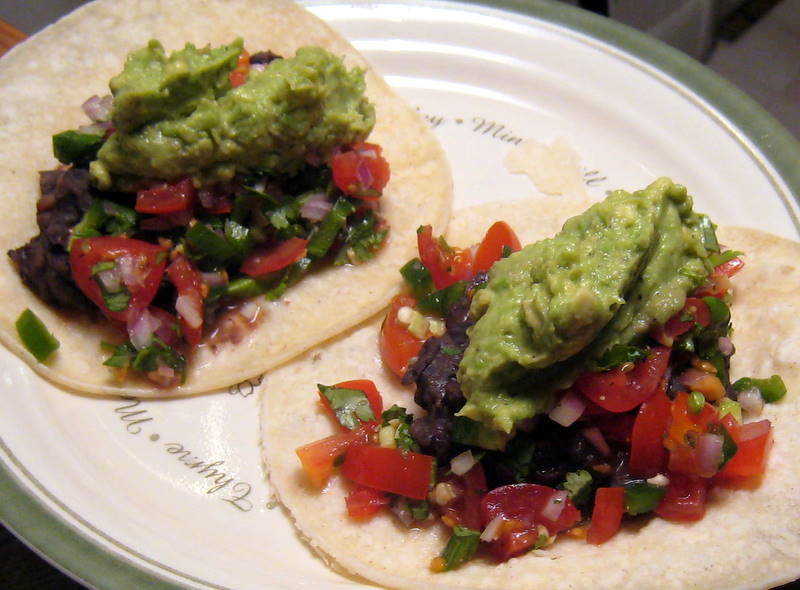 This was a quick and easy meal using up ingredients we had on hand. No running out to the store today! Adapted from Not Eating Out in NY and The Art of Eating In. Sautee red onion, jalepeno, and garlic on medium heat for about 5 minutes. Add the chipotle cubes, water, and 1 cup of tomatoes, bring to a boil, then reduce to simmer. Add salt, oregano, turbinado, and vinegar. Turn off heat and let cool. Then blend in a blender or food processor. 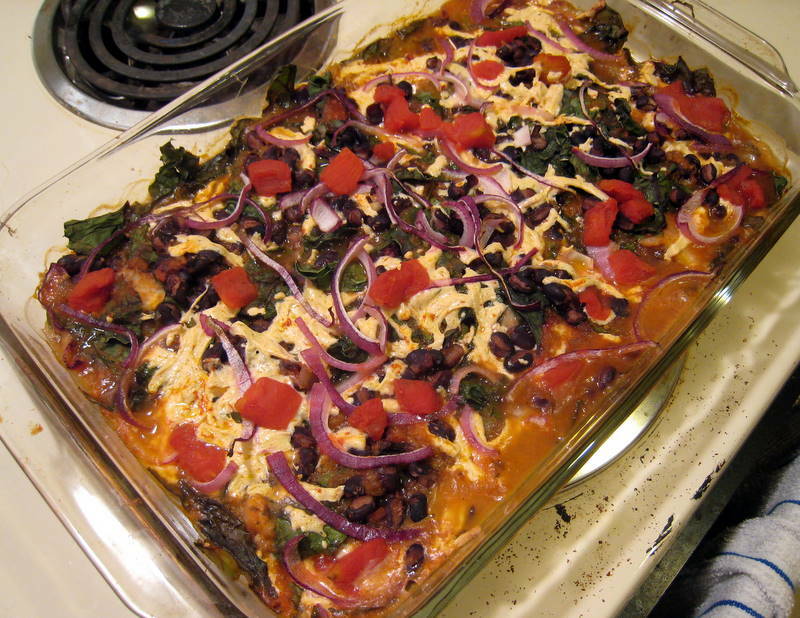 In a 9 x 13 baking dish place a layer of half of the tortilla strips on the bottom. Add about 1/3 of the sauce evenly on top. Add a layer of half the beet greens. Add about 1/3 of the Daiya, then about half of the beans. Add another layer of tortillas, more sauce, the rest of the greens, more cheeze and the rest of the beans. Top with the rest of the sauce, then the rest of the cheeze. Top with extra tomatoes (canned or fresh) and sliced red onion. Bake at 375 degrees for 30 minutes. Cool five minutes before serving. Homemade tortillas are the devil. 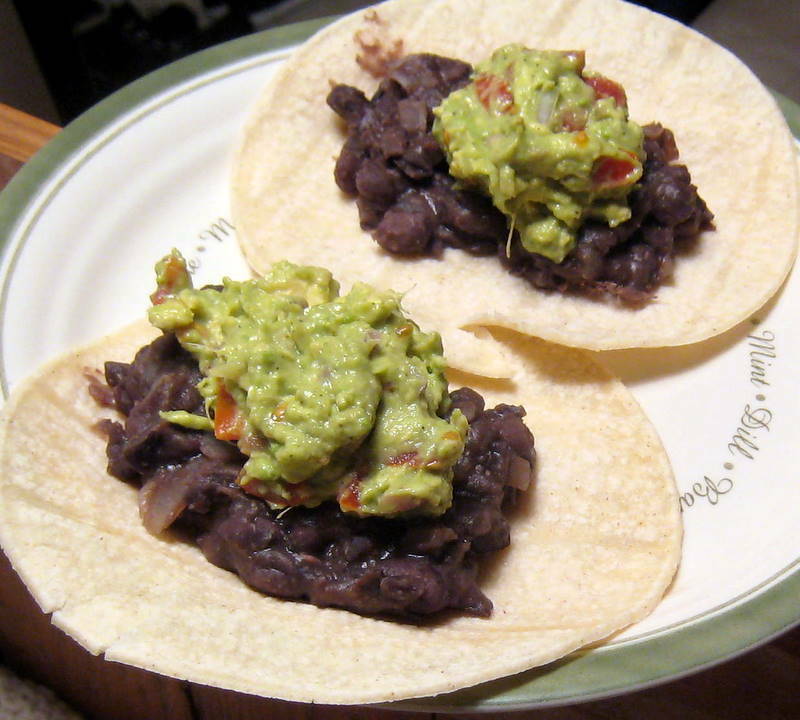 The filling is beet greens sauteed in garlic and olive oil with a can of drained black beans. For the sauce: blend together 1/2 cup cilantro (stems included), 1 clove garlic, 1/2 cup chopped red onion, 2 TBL lemon juice, 1 TBL Braggs (or soy sauce), 1 Roma tomato, 1 jalapeno (or 2 depending on the heat), and a dash of olive oil. 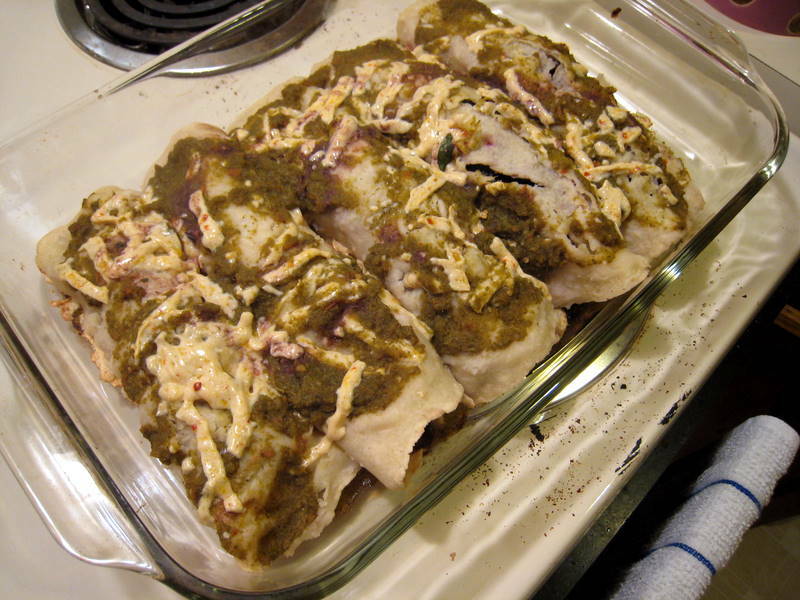 Roll enchiladas and top with sauce and pepper jack Daiya. 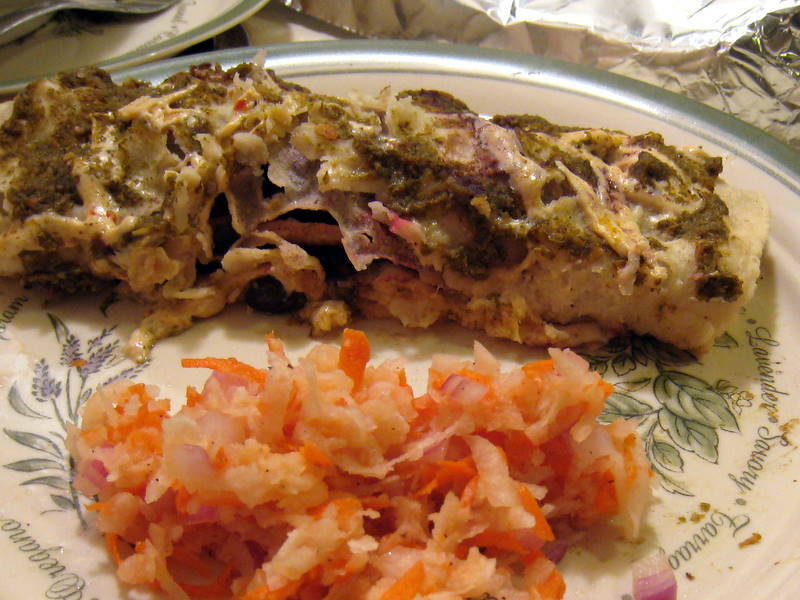 Bake covered with foil, 10-15 minutes at 400 F.
Serve with a side of jicama slaw (grated jicama, carrots, red onion, lime juice, and black pepper).